Valerie Hernandez of Puerto Rico has been crowned Miss International 2014. The 21-year-old student and model from Carolina, Puerto Rico, won her title at last night's finals, the beauty pageant's 54th annual event, held at the Grand Prince Hotel Takanawa in Tokyo, Japan. Dressed in a gold-embellished white gown, Ms Hernandez sobbed with joy as she was officially crowned by Miss International 2013 winner Bea Santiago of the Philippines. During the question-and-answer rounds in the lead-up to the finals, Ms Hernandez stated, according to the Philippine Star, 'Thinking about [the] Miss International title, I think it's not just crown, it's not just the title, it's one of the hardest responsibilities. 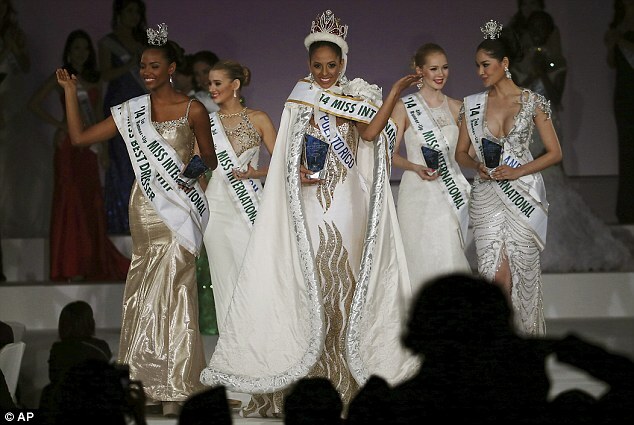 Ms Hernadez celebrated her win flanked by the rest of the top five; first-runner up Zuleika Suarez of Colombia, second runner-up Punika Kulsoontornrut of Thailand, third runner-up Victoria Tooby of the United Kingdom and fourth runner-up Milla Romppanen of Finland. On her official Facebook page, Ms Hernandez claims she was trained in classical ballet at the Escuela de Bellas Artes de Carolina. She lists Pizza Hut and Professional Gym as previous employers.